Arlington's round, cut-in FLOOR BOX KITS offer installers the low cost, convenient way to install a duplex receptacle flush with the floor. 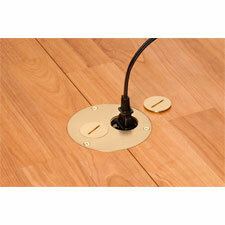 The 3.5" round, UL Listed non-metallic floor box is easy to install in an existing wood or concrete floor. Electrical conduit must be accessible from underneath the floor if installing in existing concrete. Hide miscut flooring, cover the edges of cut carpet and get a neater finish with an oversized ring or carpet ring to match your cover. Complete the job with a round 4" metal cover in brass of nickel-plated brass.